John Battelle's Search Blog LinkedIn, The Media Company? It doesn’t hurt that the business has been killing it – beating Wall Street expectations and outperforming most recent Internet IPOs. 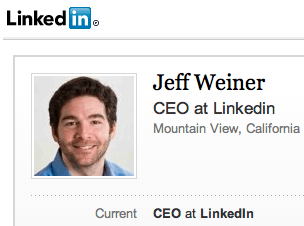 The man steering LinkedIn, CEO Jeff Weiner, will join me onstage next week at our Signal San Francisco show. We’ll have one of our trademark conversations, and I’m inviting you to help me interview him. Given Signal focuses on the media and marketing business, we’ll certainly cover off on that part of Weiner’s purview. But what else might you want to hear from Weiner? He’s always a fun interview, and usually shares very candid opinions of other players in the Internet ecosystem (he was a top executive at Yahoo and Warner Brothers prior to joining LinkedIn). Join us at Signal to hear Jeff, along with a killer lineup that includes Adam Bain, President of Global Revenue at Twitter, Tom Bedecarre, CEO of AKQA, Michele DiLorenzo, CEO of Jumptime, Konrad Feldman, CEO of Quantcast, Ross Levinsohn, EVP Yahoo, Alison Pincus, CEO of One Kings Lane, Kevin Systrom, CEO of Instagram, Tina Sharkey, CEO of BabyCenter, and many, many others. It’s a wonderful group, so register now! Sure, will do. To be clear, BPA audits in what sense? What do you wish them to do? Hi John – on the BPA Brand report publishers can now include social media stats such as Twitter followers, Facebook Likes & Linked in group memebers – which we use for events and product forums – Linked In doesnt have any kind of reporting frame for getting counts of group members, so our tech team has a diary note to log in & take a screen shot with a date/time stamp on the last day on every month – so very clunky & easy to miss – just not optimal. ah i see. OK thanks. http://www.newcommbiz.com/is-linkedin-a-social-network-a-media-company-a-business-utility-or-something-else/ I'll be interested to hear what Jeff’s answer is. Thanks Tac. I’ll try not to pretend it was my idea! I would kill a man for a LinkedIn iPad app.. ask him why they don’t have one. Now now, let’s keep it friendly here! I will. Any ideas from your experience about what’s wrong/could be fixed? This will sound harsh, but it’s the truth (as far as my experience has been with it anyway). I think the entire group model, the way it’s designed now, needs to be rethought. It’s simply too old fashioned, it’s fragmented and inefficient. I feel like LinkedIn groups are subpar social networks within a social network. There isn’t a real notification system on LinkedIn either – if there was, it’d probably drive more conversation. I think LinkedIn could be one of the most powerful social networks on the web/have the most impact in the real-world. Yes though one hire a media company does not make.. Previous Previous post: Who Controls Our Data? A Puzzle.